All rigged with Momoi mono, Quickrig Stainless Hooks, and Chafe Gear. Cuban Holes & Tuna Snack are stiff rigged with 600lb Cable. Cuban Holes - The only lures with heads that turn and adjust to the sea conditions, allowing the skirt and hook-set to remain stable, and resulting in a higher hook-up ratio. The 50 is best pulled from a long rigger or shot-gun position, while the 30 is best pulled from a short rigger. Tuna Snack - Can be pulled from any position and will raise & catch just about anything it attracts. 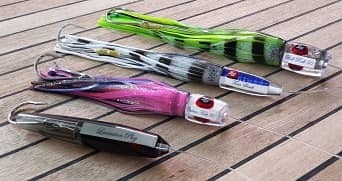 Laceration Plug - With action like none other, these lures can be pulled from a flat-line position or just back of the prop wash, and will consistently catch tuna.